Relajarse y respirar; relax and breathe. There is no better way to get in tune with yourself than yoga, and no better place to do it than in beautiful Nicaragua. Teeming with studios and retreats, San Juan del Sur has a growing yoga community in a landscape perfect for inner reflection, physical redemption, and total release. World-renowned teachers flock from far and wide to teach here. Come practice the yoga of your dreams. Nicaragua is the ultimate spot for yoga retreats. The sound of waves crashing against the shore. The peaceful isolation from the hustle-and-bustle lifestyle. The thrill of completely immersing yourself in the natural world. The victory of achieving a new pose, surrounded by unspoiled beauty. You can have it all. 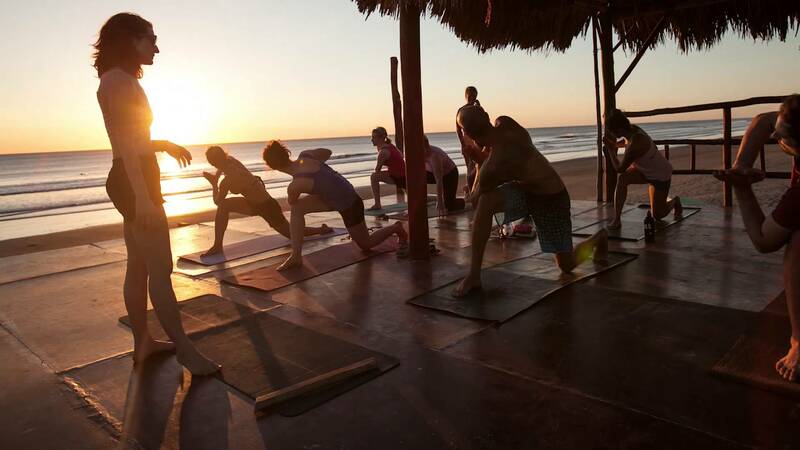 The Nicaragua Yoga Retreat Institute’s goal is “to connect the world with the Nicaraguan yoga community and world renowned wellness experts to promote peace and personal development.” They offer a wide-ranging menu of yoga retreat options, led by world-class instructors. In addition to spectacular yoga sessions, their retreats feature yoga on the beach, ziplining, sailing, horseback riding, hiking, and access to completely isolated oases. Find yourself, become closer to your body, and have the adventure of a lifetime—all in one amazing excursion. Whatever you’re taste, your body and your spirit will thank you for this exhilarating experience. For continued practice, San Juan del Sur has a thriving community of yoga studios, where you can find all types of yoga and meditation classes. If you’re looking to challenge your body, completely relax, or delve deep into your inner spirit, you’ll find exactly what you need. At Zen Yoga Nicaragua, explore a wide variety of classes zen workshops, and private instruction from top instructors: Vinyasa Flow, Chill Flow, Yin/Yang, and more. For even more isolation, just outside of San Juan del Sur, Nica Yoga offers private instruction within its residential yoga community. Whether you’re a beginner, an enthusiast, or a polished yoga professional, San Juan del Sur will take your yoga practice where you want it to be. The ultimate step in your yoga path is teacher training. Learn to fully embrace your practice and share your love of yoga with others—and make it a completely unique experience. Gather in the sunny studio of Zen Yoga Nicaragua for a 360-hour training. Venture to the glittering hills outside San Juan del Sur and do a 200-hour training at Nica Yoga: a residential yoga community that offers housing to its pupils. Or even go to The Nicaragua Yoga Institute’s luxurious resort for 100-200 hour trainings that feature the amenities of a retreat, including the chance to sail to a private island. With options galore, you’re sure to find the yoga teacher training that is just right for you. Nicaragua is a place where the beauty of the world comes naturally together with your inner self. In this unique and blooming atmosphere, your yoga practice will go to new to depths and take you to new horizons.